Summary VyprVPN is a bit more expensive, but faster and more reliable than its competition. Pros • Covers all platforms with Pro version. Cons • Expensive compared to others. • L2TP/IPSec encryption not detailed. VyprVPN is a VPN product from Goldenfrog Industries. It uses different VPN technologies, from OpenVPN to PPTP to L2TP/IPsec to get your traffic encrypted, similar to HotSpotVPN and Private WiFi. VyprVPN can encrypt any type of Internet traffic. PPTP support also means that any device you have could be encrypted using VyprVPN. VyprVPN can also encrypt traffic like BitTorrent to get around nasty bandwidth throttles imposed by ISPs. 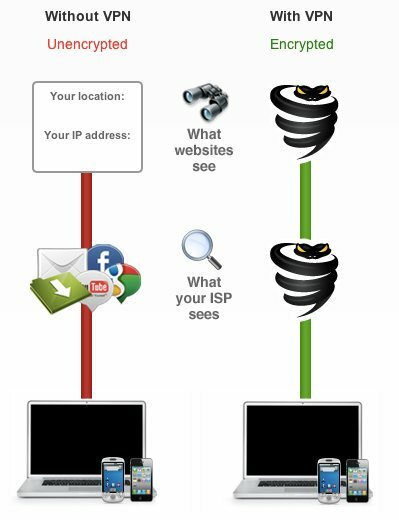 VyprVPN provides two different products: standard and Pro accounts. Standard accounts get PPTP connectivity with 128-bit encryption. Pro accounts get access to OpenVPN SSL and L2TP/IPsec in addition to PPTP. Pro users also get bumped up to 256-bit encryption. Unfortunately, this comes at a price. Standard accounts price for $14.99 a month, whereas Pro is $19.99 a month. Both only allow for one secured connection at any given time. This is much more expensive than solutions from Private Wifi or HotSpotVPN, which are $10 and $9 per month, respectively. Let's see if Vypr offers any speed or functional differences. Installation depends on the connectivity method chosen. Thankfully, Goldenfrog provides decent documentation for each supported device/platform. However the documentation isn't all up to date, especially for Mac OS X. Tunnelblick (the main OS X OpenVPN client) has made several improvements to the process of adding OpenVPN configurations to Tunnelblick, but the Goldenfrog docs haven't been updated to match. I eventually figured it out though, and I was off on OpenVPN SSL encryption using my Mac. I also tested PPTP on my Mac and my iPhone. PPTP is much easier to set up because the client is built into OS X and doesn't require any certificate file management. It's also much more insecure because of that. I did not try L2TP, because it's an older technology and generally considered insecure. L2TP (Layer 2 Tunneling Protocol) tunnels Ethernet traffic over IPSec, which opens up the local network and could possibly bridge the VPN onto the local network if improperly configured. Tunnelblick details screen for one of VyprVPN's servers. Speed appeared the same between PPTP and OpenVPN. I averaged 12 Mbps down and about 2 Mbps up, depending on the US server I connected to and the load on that server. Overall, it wasn't as fast as Private WiFi, but it worked more reliably, which I consider more important. All VPN services require that you have a compatible client on your device to connect to the VPN. PPTP continues to be popular because every major OS has a built-in client, including mobile device OSes. iOS devices also support L2TP/IPsec. But as I said, I don't recommend it for security reasons. OpenVPN was limited to desktop machines. But now there is an Android application that is getting decent reviews called TunnelDroid. Support is good overall. Goldenfrog supports is available 24x7x365 and promises to at least acknowledge your response from a live team member in 15 minutes or less. Documentation is good as well, but needs some updating for changes on particular platforms (like OS X). Security appears to be up to snuff. Pro customers get the top level encryption available for VPN type chosen, but Standard customers are stuck with PPTP. As I recommended with HotSpotVPN, I would spend the extra money for OpenVPN support if you can afford it. You'll notice that there are numerous question marks in the table to the right. That's because Goldenfrog unfortunately does not detail the encryption used in its L2TP/IPsec product. Goldenfrog would do well to be a little more thorough on the documentation front, as I've mentioned. In closing, Goldenfrog's VyprVPN is a good product, but is a tad expensive compared to some competitors. However, HotSpotVPN doesn't have the speed, and Private WiFi doesn't have the stability (yet). VyprVPN succeeds on both counts, so, perhaps its extra cost is worth it. Let us know your thoughts in the comments.